I’ve been working on decorating a Christmas skybox and also turning my SL home into a holiday retreat but it’s been taking forever! Then I discovered the joy of fully-furnished skyboxes that comes in a rezzer! All it takes is 1-click and less than 10 seconds and you’re done! 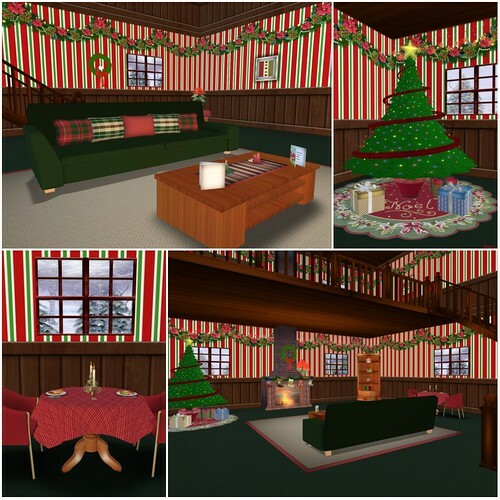 This beautifully furnished ‘Holiday Cheer Skybox’ from Surprise! may be the answers to my SL prayers. If you’re like me and you just want something to use for photos or to hang out, this skybox is the perfect solution. It’s fast, it’s easy, and it’s cute. The furnished areas includes a living room, dining area for two, bedroom, and seating area along with a Christmas tree, fireplace, and other holiday decors. My wifey Lara Aridian did an amazing job on this skybox, the finished product is terrific and makes a great addition to the Winter Wonderland Christmas Bazaar in Andarah Island! WWCB is where you can find everything you could possibly need or want to make your holidays in Second Life a special one so make sure you explore the rest of the sim if you stop in to check out the skybox!! Lara is an incredible designer and I was thrilled to see this skybox completed because its truly a masterpiece! If you think the photos look fantastic, just wait until you see it in person! The sleigh bed is my favourite because its intricately crafted with menu driven poses that range from tender cuddles to Ohhh Santa baby!